In 1547, the year when Cervantes was born, the world was no longer a small place, and Spain, under the reign of Charles I, made up half of that world. Alcalá de Henares, a busy, vibrant university town thirty kilometres from Madrid, was where Miguel de Cervantes’ life began. The fourth son of a modest “leecher” –as barber-surgeons were called at that time–, very little is known about Miguel’s childhood and adolescence. His father, Rodrigo, always lived in penurious circumstances, beleaguered by debt. His hazardous job took him from Alcalá to Valladolid, and then to Seville, though first to Córdoba, but there is some doubt as to whether his wife, Leonor de Cortinas, and their six children accompanied him on his wanderings. The only thing that is certain, is that in 1566 Miguel de Cervantes was living in Madrid, together with the rest of his family. In 1568, he penned some poems on the death of Queen Elizabeth of Valois –wife of Philip II–, that were published the following year by Juan López de Hoyos. But before the year was out, he was in Rome. How did he get there and why did he go? Documents exist of an arrest warrant against a certain Miguel de Cervantes who was tried in absentia for having wounded a foreman in a duel. The sentence contained an ironic nod to the future: ten years in exile and the cutting off of his right hand. 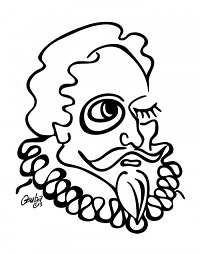 However, many people maintain that this Cervantes is not Cervantes, or that it is another Cervantes. In the Eternal City he worked in the retinue of the future Cardinal Acquaviva and then entered the army, until one day, as logic would have it –he was a soldier, he was Spanish and it was the 7th of October, 1571– he found himself in the Gulf of Lepanto, history’s stage. The sea was calm, the rival fleets roared and crept up on each other, and Miguel de Cervantes was suffering from a fever. He was given permission to take cover, but he wanted to leave his mark on history so he readied himself for combat –“the greatest event seen by past centuries”– in a skiff belonging to the galley La Marquesa. Thirty thousand men died on the Turkish side and twelve thousand on the Christian side, with the latter proclaiming victory. Three arquebus bullets hit Cervantes. Two got him in the chest and a third rendered his left hand useless. After a few months convalescing in a hospital in Messina, Sicily, he rejoined the army. The Mediterranean had become a huge battleground and Cervantes remained caught up in the whirlwind of history: Navarino, Corfu, Tunisia. He travelled the length and breadth of Italy, living to the fullest –reading extensively and enjoying life even more– and, in 1575, embarked on a ship back to Spain. He had letters of recommendation from Don Juan of Austria and the Duke of Sesto, but these letters, written with the aim of making his existence in Spain easier, ended up complicating his life. In the waters of the Gulf of Roses, the schooner Sol fell into the hands of Barbary pirates who mistook Cervantes for someone important. This delayed his rescue and increased his ransom. Cervantes spent five years in the dungeons of Algiers from which he tried to escape four times until, on the 19th of September 1580, the Trinitarian friar Juan Gil appeared with the ransom. Cervantes returned to Spain to find a country in trouble –caught trapped between grime and luxury, going from one bankruptcy to another as it expanded its boundaries and those of the world– and his family ruined by the cost of his release. In Madrid, he tried to use his achievements as a hero of Lepanto, as well as a former prisoner, to find an administrative post. He was sent to Orán on an obscure, month-long assignment with a hint of espionage, was paid fifty ducats, but that was it. Then he glimpsed America. Cervantes wrote to the Council of the Indies, asking to be sent there and given an administrative job. Nothing. The American dream –what might have been– faded on the horizon and became blurred in an ocean of unanswered prayers. “I am content with little, although I desire much” he wrote in Journey to Parnassus. So he remained in Spain, he still had Spain, and worked on La Galatea, a pastoral novel. He frequented a tavern on Tudescos Street owned by an Asturian, and he also frequented the tavern owner’s wife, Ana Franca, with whom he had a daughter. In December 1584, he travelled to Esquivias, Toledo, to intercede on the publication of the songbook of a deceased friend, and suddenly –in other words, for no clear reason– he married Catalina Palacios Salazar, a woman half his age. He spent two years in Esquivias, publishing La Galatea in 1585. Finally, in 1587, he got a job as Commissioner of Supplies in Seville. He wrote miscellaneous poems to be placed in bouquets of flowers and songbooks, sold comedies, earned poetic justice and as a prize was given silver spoons. He traversed Andalusia from end to end, requisitioning grain and oil for the Invincible Armada. The gloomy hero inhaled the dust from the roads and got used to the discomfort of the inns. He fixed the landscape in his mind’s eye and, in addition, ended up in prison (in Castro del Río, in the province of Córdoba, and in Seville) accused of collecting what he should not have, or taking too long to give the tax office the taxes he had collected. Furthermore, he was excommunicated for seizing church property. In 1601 the court moved to Valladolid and, three years later, Cervantes settled down by the River Pisuerga, surrounded by women: his wife, sisters, daughter and niece. Without warning, they experienced trouble, distress and unwanted dealings with the law. An important gentleman died –in what today we would call “mysterious circumstances”– at the door, or perhaps even within, the rented house where the Cervantes family lived. The investigation did not solve the death of the gentleman, but it did conclude that all the women of the household led a licentious life that bordered on prostitution. And then, in 1605, something happened; the printing presses of Juan de la Cuesta published the first part ofDon Quixote. It was an extraordinary success, was reprinted five times that year and was soon translated into English and French. The century progressed; the court returned to Madrid in 1606, and Cervantes returned with it. The Count of Lemos became a protector, but Cervantes suffered another disappointment when his famous patron left for Naples to serve as viceroy but did not include him in his entourage. Cervantes was a man on the cusp of two centuries and a writer of the present who looked to the future. With regard to that future, he was particularly concerned about the salvation of his soul, so he increased his presence in orders and congregations and devoted himself to pious works which he alternated with writing. In 1613 his Exemplary Novels were published. A year later, Alonso Fernández de Avellaneda –a pseudonym that has never been explained– published a second, spurious sequel to Don Quixote. As his twilight approached, Cervantes’s activity became frenzied: he wrote Journey to Parnassus, Eight Comedies and Eight New Interludes, Never before Performed and, in 1615, a sequel to Don Quixote, where fiction and reality shone to offer a refined version of the modern novel. In 1616, as spring advanced, Cervantes, bed-ridden due to illness –diabetes, perhaps liver failure–, awaited death at his home in Madrid on León Street. His agony is reflected in the dedication and prologue of The Trials of Persiles and Sigismunda. “Goodbye, thank you; goodbye, witticisms; goodbye, rejoicing friends; I am dying, and looking forward to seeing you soon, happy in the hereafter.” He withstood the pain of the illness and began fading until, on the 22nd of April, when after so much living, the moment to die arrived. Verses of circumstances Quivering in the court. Queen Elizabeth of Valois, the third wife of Philip II, dies after giving birth to a child who will also die. A shiver runs through Madrid, and the young Cervantes, encouraged by the grammar teacher Juan López de Hoyos, writes poems that will be published the following year in A Story and Relationship of the illness, death and funeral of the Queen. waiter to Monsignor Acquaviva Cervantes seeks his fortune in Rome among the dignitaries and popes. He works as a waiter in Monsignor Acquaviva’s retinue, a figure who later goes on to wear the purple robes of the cardinal. When his stint at the palace is over, Cervantes joins Diego de Urbina’s company as a soldier. He traverses Italy and it traverses him. Eleven years have gone by since he left Spain and a lot has happened in many places: Tunisia is lost and recovered, Juan de Austria dies, Philip III is born, the court makes its home in Lisbon. Spain continues to expand its world: Legazpi founds the city of Manila, Mendaña reaches the Solomon Islands. And Cervantes begins to dream of America, in vain. The life of a collector is not particularly easy. Cervantes is accused of selling wheat without authorisation and spends a few days under arrest in Castro del Río. Some scholars believe that is was here where the idea for Don Quixotecame to light; others maintain it happened later, when he was imprisoned again in Seville. The novel, long or short, was always there within Cervantes, who makes the Italian novella his own, in other words, Spanish. It seems that there are to be twelve Exemplary Novels, either because there are two in one –The Dialogue of the Dogs is part of The Deceitful Marriage – or because for years The Pretended Aunt was included in that number, although today this opinion has been rejected.